All our clients bring something different to the Ideabar party. One corners the market on fast, fried, good food. One of Ideabar’s first big-fish accounts, Bud’s Chicken & Seafood initially hired us to create print ads, then tapped us for a brand refresh. Based on market research and conversations with the Bud’s executive team, we came up with a list of recommendations. They included an updated logo, new taglines and fresh signage. The final touch: new packaging for the Palm Beach County chain that began frying chicken during the Eisenhower administration. Four years later, we continue to create print, digital and mobile ads for Bud’s. This year, the little chicken shack that could will celebrate its 60th anniversary. That’s an awful lot of Chicken Quickies, Fish Feasts and Legendary Corn Fritters. 1. Clucks for a buck: To provide for his wife and eight children, Bud Brinkman opened his first Bud’s takeout stand in 1957. The cost of a four-piece chicken dinner at that Boynton Beach restaurant: 99 cents. 2. A growing family: When Brinkman died suddenly in 1969, his oldest son, Mike, was still a teenager. But Mike stepped up and took the helm of the family business. And, within a few years, his three younger brothers joined him. The Brinkmans opened a second Bud’s location in 1976 and two more in the early 1980s. By the mid-‘90s, the chain had grown to its current seven restaurants. 3. 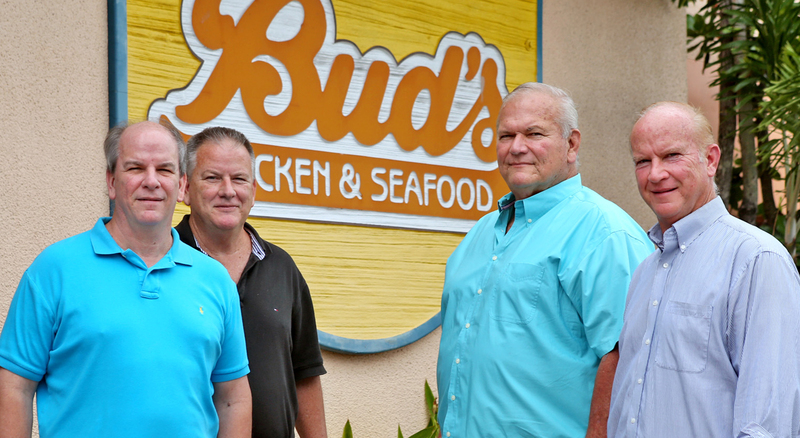 Keeping it close to home: The family has turned down offers to franchise Bud’s Chicken & Seafood. Proud supporters of the South Florida Fair and Visit Florida, these sons of Palm Beach County insist on maintaining a hometown touch and enjoy being able to visit longtime employees and customers any day of the week. 4. Made from scratch: Bud’s stores serve an average of 850 meals daily, and everything is homemade, from coleslaw to cocktail sauce to crinkle-cut fries. 5. Tried, true…and brand new: Speaking of cocktail sauce, Bud’s has used the same recipes for cocktail and tartar sauces for most of its run. The newest dipper for Bud’s chicken fingers? Sweet-and-sour Bird Sauce, named after Jason “J-Bird” Pennington of “The Kevin, Virginia & Jason Show” on 97.9 WRMF.